Indian cricketer-turned-politician Navjot Singh Sidhu today hoped that his friend Imran Khan's accession to the prime minister's post will be good for Pakistan-India peace process. 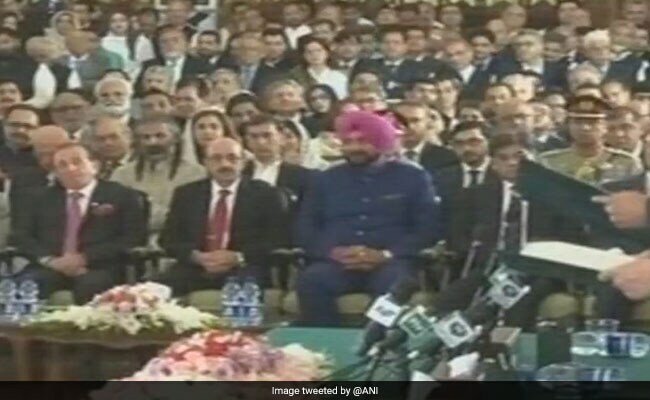 Wearing a blue suit and a pink turban, Mr Sidhu was among the special guests present at the newly elected Imran Khan's oath taking ceremony at the Aiwan-e-Sadr (the President House) in Islamabad today. Pakistan Army chief General Qamar Javed Bajwa, after arriving at the ceremony, went to the front row of the guests where Mr Sidhu was seated and hugged him. The both of them chatted briefly and warm smiles were exchanged. They hugged once more. Talking to the state-run PTV, Mr Sidhu used his usual poetic expression to praise Mr Khan. "A new morning is here in Pakistan with a new government which can change the destiny of the country," said Mr Sidhu, a minister in the Congress government in Punjab. He hoped that Mr Khan's victory will be good for the Pakistan-India peace process. The ties between the two countries had strained after the terror attacks by Pakistan-based groups in 2016 and India's surgical strikes. The sentencing of alleged Indian spy Kulbhushan Jadhav to death by a military court in April last year further deteriorated bilateral ties. Mr Sidhu arrived in Lahore yesterday via the Wagah border. He travelled from Lahore to Islamabad to attend the ceremony. Welcoming the "change" in Pakistan's democracy with the election of Mr Khan as prime minister, Mr Sidhu on his arrival in Pakistan said the newly elected PM should come forward in peace initiative between the two neighbours. "I have come here not as a politician but as a friend. I have come here to take part in the happiness of my friend (Imran)," he had said, adding sportsmen and artistes help bringing the people of two sides closer. "Hindustan jeevay, Pakistan jeevay," he chanted while reading a verse. Talking about the qualities of Mr Khan, the former cricketer said: "I have seen Khan converting his weaknesses into his strength. I wish Imran becomes a symbol of prosperity (for his country)." Replying to a query on the gift he has brought for the former Pakistan Test captain, Mr Sidhu said: "I have brought a Kashmiri shawl for Khan sahib." Former Indian cricketers Sunil Gavaskar and Kapil Dev whom Mr Khan had invited on his swearing-in had declined the invitation citing personal engagements.